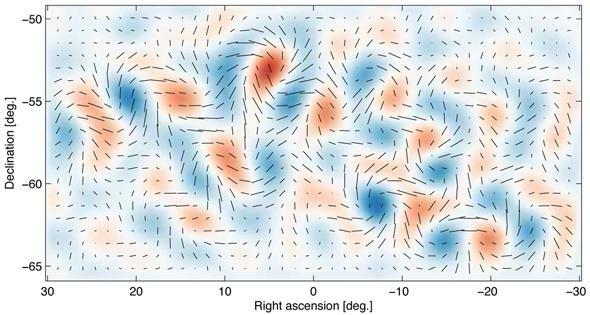 Evidence of inflation: Astronomers detect gravitational waves from the early Universe. The imprint of the Big Bang: B-mode polarization (the swirls) of light coming the first fraction of a second after the birth of the Universe itself. Update, Jan. 31, 2015: Disappointingly, the big discovery announced here was premature. In their analysis, the scientists used preliminary data from Planck about the amount of dust in our galaxy (which looks very much like the signal from the early Universe for which they were looking), and newer analysis shows they underestimated it. This means the signal of inflation they found was actually far weaker than they first thought, and is not statistically significant; that is, they can’t say if it’s real or not. This is big news: Astronomers have announced that they have seen, for the first time, direct evidence of “inflation” in the extremely early Universe, unlocking an entire chapter in the history of the cosmos. It also ties together relativity and quantum mechanics in a deep and profound way, which has never been done before. This news is very important and very interesting. However, it’s also very esoteric—probably the most layered and complex announcement I’ve ever written about. It’s not like the Higgs boson, which could at least be summed up in a sentence or two. But this new work unveils a critical point in the history of the Universe and has profound implications for physics. I’ll note that in preparation for this announcement, Sky and Telescope put up a nice overview, as did the Guardian. My friend, the cosmologist Sean Carroll, has a fantastic writeup about it. It starts off semi-technical and becomes very technical in the second half, so be ye fairly warned, says I. He has a follow-up post with more details as well. We know the Universe is expanding; everywhere we look, it appears that galaxies are rushing away from us. If we run the clock backwards, this means the Universe was smaller in the past and at some point must have had (nearly) zero volume. This point in time is commonly referred to as the Big Bang, when the expansion of the Universe started. Here we are, 13.82 billion years later. But a lot happened in the intervening time, and a lot of it happened at a teeny tiny fraction of a second after the First Moment. One of these things was inflation. Inflation is a bit of a mind-bender, I’ll admit. It started just about 10-35 or so seconds after the bang. To give you a better idea of how short a time interval that is, we’re talking 0.00000000000000000000000000000000001 seconds! And it only lasted until about 10-32 or so seconds later, so it was incredibly brief by human standards. But in such fleeting moments are Universes forged. During that period, for reasons that are still not clear, the Universe underwent a kind of hyperexpansion. Instead of simply cruising along, getting bigger with time as it does now, the expansion accelerated. Hugely. Hugely hugely. Some models show it increased in size by a factor of 1050 (some say even more)—that’s 10 trillion trillion trillion trillion times bigger, all in a time frame so small that analogies fail me. Like I said, inflation is a mind-bender. The reason we think this happened is that the Universe appears very smooth. You’d expect it to be very lumpy, with some parts packed tightly with matter and energy, while other parts would be empty. But when we look at the distant and ancient Universe on really big scales, we see it’s incredibly smooth. Telescopes looking back into the deep Universe can examine the leftover heat from the birth of the Universe, and measure how bumpy it is. Amazingly, it’s smooth to one part in about 100,000 (I explain this in more detail in an earlier post). Inflation solves this problem: The Universe started out lumpy, but during the period of hyperexpansion all the lumpiness got smoothed out. It’s like having a wrinkly sheet, then pulling on it from all sides. The wrinkles vanish. Not only that, but inflation solves a problem about the geometry, the shape of the Universe. I won’t go into detail here; you can read more about it if you like. The point is, astronomers dreamed up this idea of inflation to explain some weird stuff we saw about the Universe, and it did a pretty good job. It’s held up over the years. 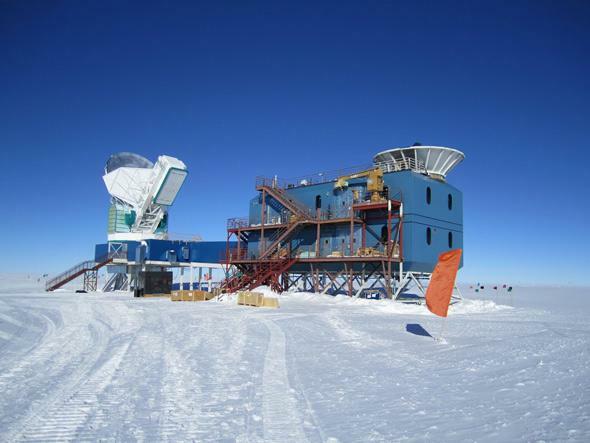 Observing the frigid depths of the Universe from the frigid depths of Earth: the BICEP2 facility in Antarctica. But all that was indirect evidence for it. Scientists prefer direct evidence, and we don’t have any for inflation. Until now. That’s what these new results show. Inflationary models predict that other marks were left on the Universe, and one of these is that as the Universe underwent rapid expansion, it would create ripples in the fabric of space-time called gravitational waves. These are literally small expansions and contractions of space itself, like a wave traveling down a Slinky. We know these exist—we see their effects in astronomy, and two astronomers won a Nobel Prize in 1993 for finding an example of gravitational waves—but seeing them coming from the inflationary period of the Universe is incredibly difficult. We don’t see the waves themselves, but we can detect the effect they had on light coming from the early Universe. The waves would polarize the light, in a sense aligning the waves of light in certain ways. There are many different ways light can be polarized, but gravitational waves left over from inflation would do so in a very specific way (called B mode polarization, which twists and curls the direction of the polarization; see the image at the top of this post). Finding this kind of polarization in the light leftover from the fires of the Big Bang would be clear evidence of gravitational waves… and it was precisely this type of polarization that was finally detected by a telescope called BICEP2 (Background Imaging of Cosmic Extragalactic Polarization), located in Antarctica. 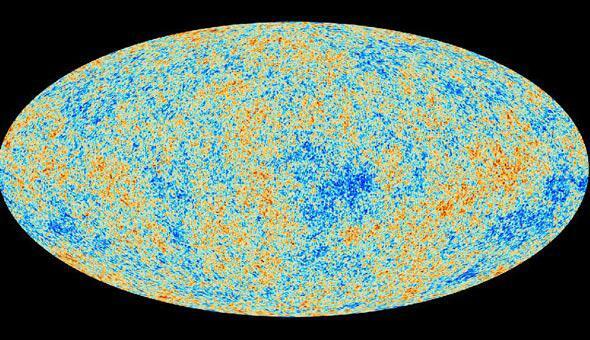 The Cosmic Microwave Background, the leftover glow from the first moment of the cosmos. The red and blue patches represent fluctuations in the smoothness of the light of only one part in 100,000. Click to explainanate. Still with me? I know, this seems all very distant and removed from our daily lives, but in fact this is a very big deal indeed. Until now, inflation was a great idea—a critical one to understand the evolution of the Universe from the very first moment after its birth to the huge structures and details we see today—with no direct evidence. Now we have direct evidence. Up until now this was all like trying to write a history book about the United States and talking about the Civil War without ever knowing exactly what happened at the time … and then finding photos and diaries and battlefields. This inflation-spawned gravitational-wave-induced B-mode polarized light is like having the words appear on what were before blank pages in a chapter about the Universe itself. This light is showing us what happened in the tiniest fraction of a second after the birth of our cosmos. This is crucial. There are many different physical models of how inflation might have worked, and observations like this will be able to help us figure out which ones work, which ones don’t, and which ones might need tweaking. The strength of the gravitational waves was stronger than predicted by models, for example, so you know a lot of cosmologists are right now standing in front of blackboards, hunched over papers, or sitting back in their chairs with their hands interlocked behind their heads, puzzling over what variables, what parameters, what equations must be poked at to reproduce these new observations. Inflation was a time of a huge phase change in the Universe. Finding direct evidence for it will trigger a similar phase change in the way we understand it. I mentioned the Higgs boson earlier; that beast is the linchpin in modern particle physics, and finding evidence of it was a very big deal. This discovery of evidence for gravitational waves from inflation is a similarly important event in the field of cosmology. If the findings stand up, I imagine there might be a Nobel Prize in store for someone (or someones). But what does this meant to you? Well, that’s up to you, of course. Most of us can live our daily lives without worrying overly much about gravitational waves, subatomic particles, or what the Universe was like in the tiniest sliver of the first moment of its existence. But think about that: We can understand what the Universe was like in the tiniest sliver of the first moment of its existence! These aren’t wild guesses, or just-so stories, or fanciful myths. This work is the result of an intense amount of research, the application of math, science, physics, and technology over hundreds of years, the painstaking acquisition of knowledge that must withstand the fires of scientific scrutiny and skepticism to survive. And so far, they have. There are practical concerns here as well. Inflation is based on principles of quantum mechanics, while gravitational waves are the purview of relativity. QM has brought us computers, solar power, atomic energy—a huge amount of modern tech. Relativity is critical in many aspects of our lives as well, including GPS and also nuclear power. In the past these two concepts haven’t played well together, but now we have a direct and profound connection between them. This result is new, and we have a long, long way to go to understand it better. There’s no way to know what will result from this. Yet. But whenever we open up new fields of science, all sorts of interesting things follow. Bet on it. And a final note. I am not a cosmologist; I am an astronomer. But I’m also a human, and when I look out into the dark sky at night or gaze at a gorgeous image from a telescope, I wonder how this all came to be, why things are the way they are, and how they happened to shape themselves into the Universe we see today. I bet you’ve wondered about them too. These questions have been asked since we’ve been able to ask questions. Science is now answering them.